Home / -News- / Madonna / Is Madonna Working on New Music? 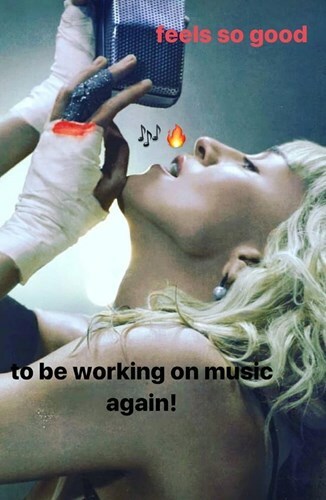 Is Madonna Working on New Music? Madonna's last album, Rebel Heart, was hardly a barn burner sales-wise. It started strong with number 2 debuts in both the U.S. and U.K. but, so far, the album has only sold 238,000 copies in America and 77,000 in Britain. Yet, her tours continue to be major affairs, selling out around the world so who would blame her if she decided to forgo any further recording? Not Madge. It looks like she is back in the studio putting together a new album for 2018. Late last year, she talked to a number of sources about where she might go with a new release and, this week, she posted a clear indication that she is either in the studio or will be imminently. Now comes the mystery. That image, which was posted on Instagram, is now gone. Is she currently creating something new? Did someone on her team make the post with out Madonna's consent? Was she just playing a game with fans and teased them with a flash of hope? If a new album does make it to the market this year, it will be her first since 2015's Rebel Heart and her fourteenth overall. In the U.S., eight of her thirteen studio albums topped the charts while nine made it to number 1 in the U.K. Three additional albums, the Evita soundtrack and The Immaculate Collection and Celebration also topped the British charts.